Wasi Country Park is a multi-serving residential project which has been initiated in Karachi by the renowned WASI Brother’s & Developers in the industrial city Karachi. The Wasi Country Park is offering residential apartments, bungalows, and cottages for the middle and low salaried people of the country. The project will be one of the most astonishing and lucrative schemes of its vicinity that will be offering a high class and the most advanced living environment to the inhabitants of Karachi City. Wasi Country Park is providing a community living which has been made secure with the placement of the boundary wall. It is a place for the average people who want to experience a facilitated and luxurious lifestyle with affordability and convenience. It is an ideal living place which is offering many options to you from which you can choose according to the needs and desires of families. This modern development in Karachi has introduced new ways and modes of living to people who want to experience something unique without bringing troubled about high prices. Comforts and luxuries are at the core of Wasi Country Park with the world-class amenities and features. This project offers you the best a residential place can provide. It provides you with an opportunity to lead a remarkable and memorable life with your family. You will find this place exactly in accordance with your dreams and desires about an ideal living place. Wasi Country Park is offering finely architected private one unit bungalows with 3 bedroom option, cottages featured with 2 bedrooms, and also providing finished apartments with 4 & 5 bedroom options. All the living options will be featured in modern life amenities and state of the art architecture. They all have spacious and outclass bedroom with attached washroom, American style Kitchen, Drawing/Dining options, lobby and also parking spaces. Shops and showrooms are also available which are very suitable for commercial purposes. The entire project has been made with the aim to provide a classy living area to give the moderate and salaried people their dream home where they can live happily in the availability of contemporary luxuries. Moreover, the project is found to be located at the junction of Super Highway Karachi and Scheme-45, right on the crossing of Gulshan-e-Maymar entrance. The commercial area of the city and also IT College of Gulshan-e-Maymar are found at a short distance while Northern Bypass is passing just close to the project. It is connected to many important spots and projects in the city. Many residential and commercial developments have been done here while many are still going on. This area is becoming the centre of attention to many people and investors because of its beneficial surroundings, linkage to important roads and beneficial neighborhood. All this make it the desirable living and investment location where all the facilities will closely available to you. The value and demand of such location are very high and will continue to increase in the near future. The importance of location cannot be denied and this place shares a very desired and appealing address to suits your residential and commercial requirements. It enjoys great connections and proximity to the city’s best schools, healthcare units, transportation and shopping centers. This place is offering very ease and convenience to people in the payments and dealings of properties. Very flexible and appealing payment and instalment policies are available for people. As we know that this place is highly affordable and luxurious one with so many options available to you. Wasi Country provides an opportunity to almost all people to buy a place with much affordability and convenience. You do not need to trouble about the high prices. All the properties are very reasonably priced according to the needs and demands of clients. Prices are different according to the property types and sizes. The payment plan of this place captures the attention of average people to buy a residence here according to the contemporary time’s needs and demands within their range. The commercial and residential both can be booked on easy installments with the payment of certain down payment at the start of booking. It is a project by Wasi Builders and Developers which is a well-reputed and prestigious name in the real estate market. It is an outstanding project which introduces new and advanced modes of living to people. They have earned a great reputation after the successful establishment of this Wasi Country which is a very tremendous development on the real estate of Karachi. The developers have done all the work with professional excellence, honesty and integrity while making it a very out-class place to live and invest. The developers have done each and everything according to the latest technologies and techniques which will provide an opportunity for people to elevate their living standards. The team of experts and professionals have made us available a place where luxuries and style are combined for all. A unique concept and idea of living are presented by the developers through this project which caters to the desires and wishes of people. New and advanced infrastructural development and designing grab the heart and attention of a large number of people to live here. Living here will give them a sense of peace, comforts and wholesomeness. The world-class amenities with the remarkable development ensures a very high value and demand both in the present as well as in future. High global standards and excellent construction ideas are being followed for the establishment of this place. It is a dream of everyone to own a house where living would be a source of comforts and luxuries. In the current time, it is not enough to just have a home to live. Much more is needed to lead a delightful and contented life. Modern facilities and amenities are very important to have which will make the lifestyle more elevated and life more easy and meaningful. 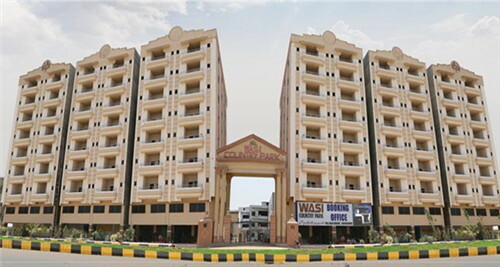 If you are the one in search of a perfect and excellent lifestyle at the top-class location of Karachi, Wasi Country Park is a perfect choice for those. It is brilliantly developed with the ideas of sophistication where living will give you amazing feelings. A complete and striking picture of a truly ideal residential place with the world-class amenities and facilities is presented through Wasi Country Park Karachi. It is a great living destination for all!